With the start of the new year, many people make weight loss resolutions. The biggest roadblock to weight loss success can be seeing tangible results in a reasonable amount of time. It can be disheartening to eat consciously and workout religiously yet never see the scale move or the jeans get loose. The key to meeting your goals is finding a program that works for you and in your time frame. 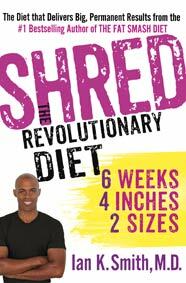 A new program to the weight loss field is Shred, the Revolution Diet by Dr. Ian Smith. Known as a diet guru, Dr. Smith gained success with his previous book the Fat Smash Diet. His latest book address dieters who have hit a plateau or are looking for more gratifying results. While no program is a guarantee, this system enhances the possibility to lose 4 inches and 2 sizes in 6 weeks. While reading through this book, I was shocked at how easy it seems to follow. By eating certain foods at varying intervals, you can stimulate weight loss. Most importantly these foods are normal items that you can find in the store and the portions aren't insanely tiny. For me, I appreciate that a lot of the diet is real food, not shakes. I like to be able to chew and enjoy a good meal. My biggest stumbling block would be to get all the meals and snacks in during the intervals (harder for a busy mom). The other key to this diet that I greatly appreciate is the requirement to exercise, specifically cardio. I am known as the cardio queen. From the elliptical to spin class, I love to sweat it out at the gym. Under this program all my cardio time is encouraged. Personally, I think that being active 40+ minutes a day is good not only for your waistline but also for you mentally. I take that time as "me" time to work out my frustrations, problems, and just let it all go. Knowing that I'm assisting in weight loss goals is an added bonus. If you are looking for an easy to follow program that could achieve tangible results in a short period of time, check out Sherd, the Revolution Diet. It could put you on the path to a new you in 2013. Shred, the Revolution Diet can be purchased at most booksellers and online. To reach Dr. Ian Smith, please visit his social media pages at his website, and Facebook page. Disclosure: I received this book to review. All opinions are my own. I've been hearing about Shred a ton lately, so it must be working well for a lot of people! Wow, you know, I heard about Shred but wasn't sure what it was. Thanks for the post. I am so checking into this!! Thanks for sharing...I also like plans that really encourage healthy eating instead of choking down shakes. I definitely need more cardio too! !